The title of this blog post is a bit facetious. I’m not actually using ARCHICAD incorrectly. I’m just using it creatively. Don’t get me wrong. There are definitely ways to use ARCHICAD wrong for the wrong reasons. But there are also ways to break the rules correctly. They are color coded blue and red in both 2D and 3D by using Pens and Fills, and Surfaces. They have the highest priority (999). The color coding makes for nice visuals—see the start or end of this post for proof of that. Any view with the colors showing is so amazingly easy to understand, once you know which color is supply and which is return. ** When I first started modeling ductwork, the goal was just visualization of the runs. But of course visualization is just the gateway drug of BIM. We start with graphic communication and then realize there’s so much more. After all, beauty is third (if not fourth). The Building Materials aren’t just to control graphic uniformly throughout the project. The high priority of my supply and return Building Materials means that elements using these BMats will cut through any other element they pass through. If the duct runs through a Beam, Slab, Wall, or Column, it will cut it (or Roof or Shell, if the elements are connected). For smaller projects, or ones without a huge amount of ductwork, that means I can hide the ductwork and look for holes in the remaining elements. That’s not the most sophisticated clash detection in the world of BIM, but it’s smart modeling. And it’s probably better than you currently have access to on a day to day basis. Think of it as passive clash detection. 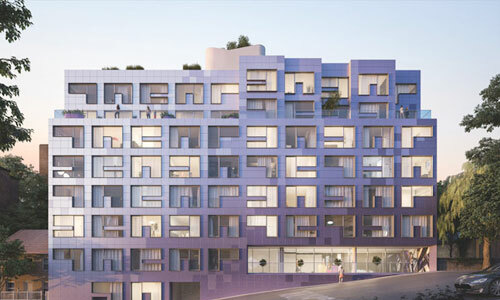 By the way, if you decide you want to show the ducts as their proper material at any point during the project, rather than the schematic colors of blue and red, just change which Surfaces are connected to the Building Materials. So simple. So fast. They reference the appropriate Building Material. They are the typical shape of my ducts (I’m mostly doing flexible round ductwork for custom residential). If I regularly did rectangular ductwork, I would create Complex Profiles for them too. They are stretchable both horizontally and vertically, so that one complex profile can manage all the sizes I need for supply or return. 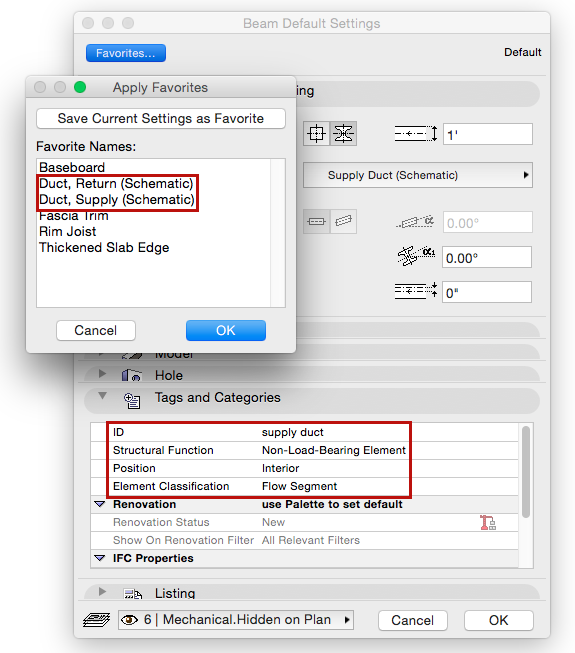 This simplifies management of ducts and minimizes clutter in my Favorites. Also it means changing the size of any placed duct is done locally, which is a good solution given the bigger picture. They are set to the minimum size I need (because you can stretch bigger, not smaller). They have a logical location for the hotspot/reference line so that the duct will always grow in the direction I want. In the image above, the reference line is in the center, but I could easily change that from the middle to the top or bottom if I moved the relationship of the Fill to the reference line. This is again a reason why using a single stretchable Complex Profile for all supply or return ducts makes sense. They can be applied to either Columns or Beams. I typically always use Beams, but once and awhile a column is necessary. Beams are particularly great because you can rotate and slant them. Plus they are reference line based elements which join easily with each other. They include all the standard stuff like preferred Layer, default size, Floor Plan and Section info, etc. They include additional data, such as basic Tags and Categories information. You’ll notice in the image above I’ve set the ID, Structural Function, Position, and Element Classification. I could go farther and add other IFC data, if I wanted or needed to. Adding the Tags and Categories data is nice because if all the supply ducts are labeled as such, they are easy to find in the schedules, the IFC Manager, Solid Element Operations lists or anywhere else elements are listed by their IDs. Also if you are into labeling things in ARCHICAD, it’s handy for that too. The IFC classification is an important aspect of this solution to end on. 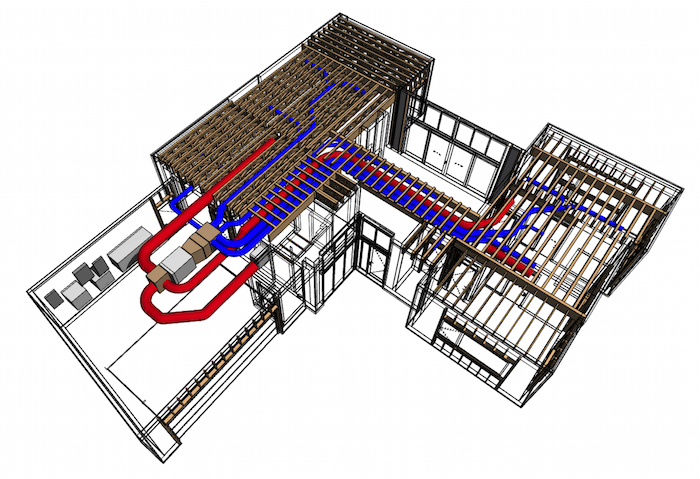 There are more appropriate ways to model ducts in ARCHICAD, particularly using the MEP Modeler or purpose built Objects. 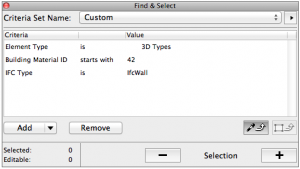 There are no out of the box duct Objects in ARCHICAD 19 (so that’s a hurdle to overcome). And not everyone owns the MEP add-on, or is working with teams that have access to it. Furthermore, other options are new workflows whereas the solution above is something you are comfortable with (using Building Materials, Complex Profiles, Favorites, and the Beam tool). While the MEP Modeler is probably a superior solution, offering more options and deeper details, my route is fast, easy to work with, and has the simplicity that matches my purposes. It also scales. By paying attention to IFC classification, it has the potential to export properly to my collaborators. It is also easily excluded if I am already doing other IFC work—by assigning basic IFC classifications it’s not cluttering up my list of beams that are actually IFCbeams. It’s a workflow that might not be ‘correct’, but it supports better methods and encourages me to think about both the ‘correct’ way of working and how else I can use ARCHICAD creatively. I should actually have four favorites, two each for beams and columns. This is a hole in my template that I’ll fix. As a reminder, you can download my template and play around with what I’m describing. All of these Building Materials, Complex Profiles, and Favorites are a part of my template (which is free, if you want it to be). Fundamentally this workflow is aimed at making us think about systems and hidden elements. Architects typically don’t show ductwork. We have a million excuses. A lot of those excuses are just the legacy of traditional methods of documentation. Modeling ductwork, if we know it, is easy. Even if we don’t know it, it’s easy to diagram out and make sure whoever is modeling it or designing it doesn’t do something stupid. If we have an easy way to model the ducts in a project, then we can start designing their paths or the volumes available for them. The chances our overall designs get ruined because we forgot to provide the necessary space decreases. But this is of course about more than ductwork. Once we model ductwork, we will probably spend the time to add the mechanical equipment and supply and return grills. The same tricks apply for modeling equipment (we can talk another time about always using Lamp elements for lighting). You can use Objects or Morphs, but Columns and Beams work great for general sizing. I love columns for generic mechanical equipment because their height, width, and depth are all controllable numerically in the Info Box. The basic shapes Objects are wonderful too. And again you can update their basic IFC data under Tags and Categories so that they have the correct ID, Classification, etc. 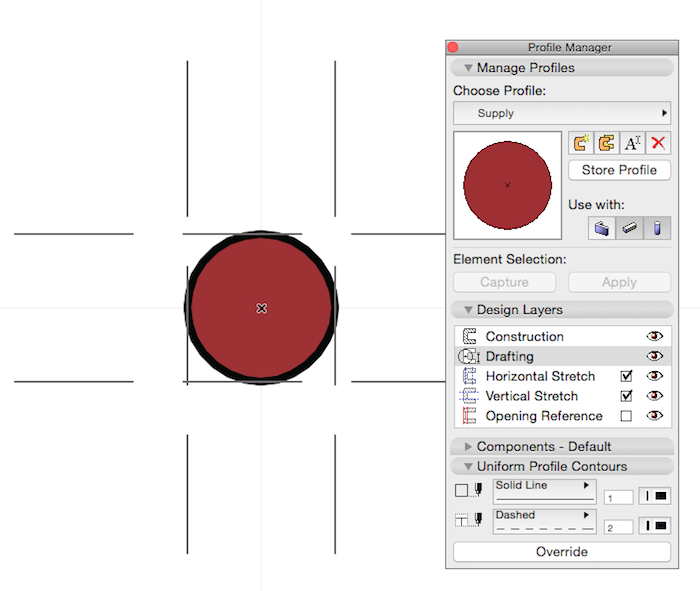 If you are adding these elements into your model, it’s just the rough dimensions that matter. At least to begin with. Maybe someday this process will lead you to wanting more detailed geometry and more intelligently linked elements. 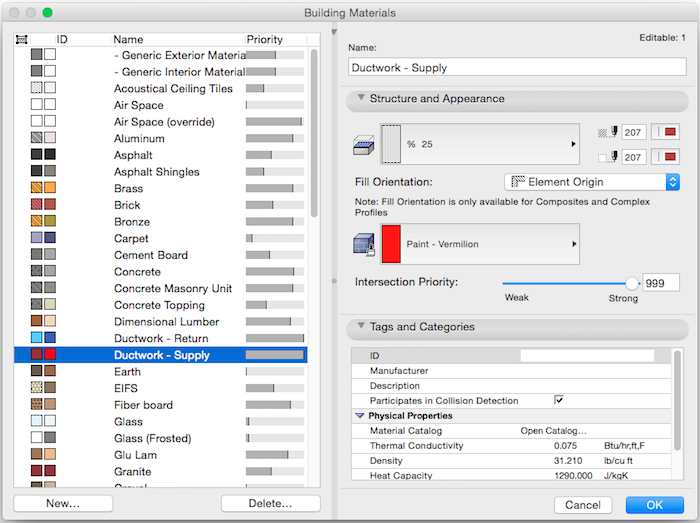 But my hunch is that before it leads to that, you’ll be creating other Building Materials, Complex Profiles, and Favorites for other hidden systems like hot and cold water or gas pipes. Even if it’s just for your own design criteria, why wouldn’t you at least schematically model your ducts (and other hidden systems)? Oh I know why, because once you do, you’ll want to also model all your lighting too (which you’ll also want for your renderings). Ducts and the hidden parts of light fixtures are so often in conflict, so it won’t take you long to want to model those schematically as well. Remember, this isn’t doing another discipline’s job. This is doing your job. This is helping you design better. This is helping you take control. **I live in cold climates so supply in my template always red. But if you live in a climate where air conditioning matters more than heating, you might reverse the colors. Which, if you are really observant, you’ll notice is the case in the 3D images at the start and end of this post—both are for projects in Texas. If you aren’t using the MEP add-on, it’s not too hard to create a similar functioning Label using the default Labels for my beam and column solution. Do you know how to size ducts? I may have known how, many years ago, but… Creating a path is only half the battle. 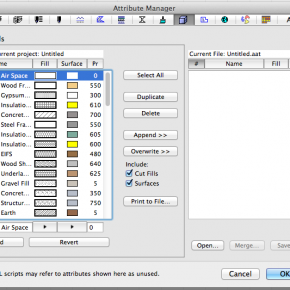 Do you mean how to change the sizes in ARCHICAD? That’s just changing the dimensions of the beam or complex profile. Or do you mean actually size them for the project? In that case, no. But I can make guesses and ask an expert! I just would like to ask how to start putting PIPE WORKS using MEP Modeler. When I open my .pln Archicad Project and when I try placing a pipe, it does not appear. But whenever I hit new to Archicad and I place pipe or whatever, then it shows. Can you please help me how to start placing pipes and ductworks in a finished Architectural project? and Options > Work Environment > Work Environment > Work Environment Profiles but still of no avail.